Presidential candidate of the Peoples Democratic Party, PDP, Atiku Abubakar has defeated President Muhammadu Buhari of the All Progressives Congress, APC, at the polling unit of Babajide Sanwo-Olu, governorship candidate of the ruling All Progressives Congress (APC) in Lagos state. 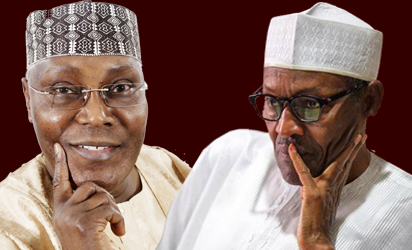 In Enugu, Atiku also flawed Buhari in some polling units in Enugu North Senatorial District. At Femi Okunnu polling unit in Ikoyi, a polling unit in Lagos where the APC governorship candidate, Sanwo-Olu and his wife had earlier on cast their votes, Atiku polled 52 votes while Buhari polled 48 votes. In Enugu, particularly from PU 016, Ogui New Layout LGA, Obiagu Road Primary School 015, Enugu North Senatorial District, Atiku polled 64 votes while Buhari polled 3 votes. Also in the polling units in Enugu, for Senatorial position, while PDP polled 56 votes, APC polled 8 votes. In ward G, Olowora, Koshofe Lga, Ketu, Lagos state, while APC poll 78 votes, PDP polled 59 votes. In Abia senatorial polls, for Abia north, while PDP polled 15 votes, APC polled- 154 votes. In In Plateau state, at PU 023, Janta Adamu ward, Hill Station Junction, Jos north LGA, while APC polled 7 votes, PDP polled 34 votes. In Adamawa state, Lokuwa ward, Low-cost PU 016, Mubi north LGA, while PDP polled 156 votes, APC polled 78 votes. In Anambra state, at the vice presidential candidate of the PDP, Peter Obi’s polling unit, particularly in PU 019, Umudimakasi Square, Agulu, PDP polled 258 votes while APC polled 1 vote. In Kwara state, at PU 009, Kere Aje in Offa LGA, APC polled 116 votes while PDP polled 23 votes. In Akwa Ibom state, at Ward 3, Etinan, PU 1, while PDP polled 219 votes, APC polled 109 votes. Meanwhile, Presidential candidate of the All Progressives Congress, APC, Muhammadu Buhari has defeated the Presidential Candidate of the Peoples Democratic Party, PDP, Atiku Abubakar at Atiku’s polling unit in Yola.